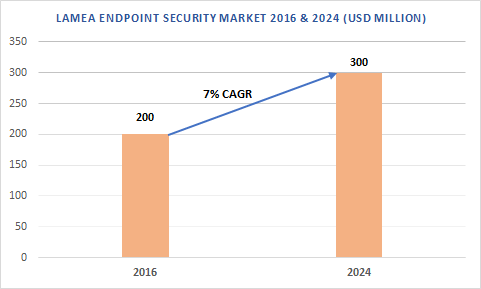 LAMEA Endpoint Security Market was estimated to be over USD 200 million in 2016 and is expected to exhibit a growth rate of over 7% due to increase in the internet usage and spending on endpoint security solutions. For instance, according to Mexico’s census bureau, INEGI, there are more than 62 million internet users in the country that account for more than 56% of the total population. The region has a high percentage of cyber-crimes, such as DoS attack, scams, thefts, and spams, impacting the networking & critical infrastructure. At least 500 companies in Mexico were affected by the WannaCry ransomware attack in 2017 including the companies in banking, telecommunication, and retail sectors. The government policies, protection protocols, and industry practices are driving the market growth and will increase the potential of domestic & foreign vendors to expand in the region. The mobile device security software is expected to witness the fastest growth rate of over 8% during the forecast timeline due to the rapid penetration of smartphones and increased investments by the government in the broadband infrastructure. High-class connectivity has fueled the adoption of digital platforms among organizations for conducting online transactions, resulting in the upsurge of cyberattacks. The international regulatory bodies are also assisting the regional agencies in combating cyber-crime. For instance, in October 2018, INTERPOL launched a training project, Cyber-crime Building Project, in the Americas assisting police across Latin America and the Caribbean to enhance their capabilities to fight cyber-crimes. The three-year project will help to build their knowledge and skills through mentoring, training courses, and public awareness initiatives. The endpoint security market in Israel is expected to witness the highest growth rate of around 8% from 2017 to 2024. The Israeli government is making efforts to promote the development of the country’s IT security by launching programs to enable security companies to test their technologies. For instance, in August 2018, the Israeli government launched a three-year program to accelerate investments in the cybersecurity companies. The government invested around USD 24 million to bolster its position in the cybersecurity market and make the country an attractive hub for security startups. The government agencies in the country are looking to collaborate with several countries including India to develop cyber shields through its agency, Israel National Cyber Directorate (INCD). The companies operating in the endpoint security market are focusing on strategic partnerships to enhance their capabilities and gain more endpoint security market share. Some emerging start-ups are raising funds to establish their presence in the market. In February 2018, Panda Security Africa entered into a cyber alliance with BDO South Africa and used its next-generation endpoint detection & response solution to provide managed security services to its customers. In Israel, the cybersecurity companies raised around USD 1 billion from around 100 funding rounds in 2018. Some of the leading endpoint security companies operating in the region are Cisco, ESET, F-Secure, IBM, McAfee, Comodo, Kaspersky Lab, Webroot, Microsoft, Symantec, VIPRE, Trend Micro, Sophos, Ahnlab, and Panda Security.